In our apartment on the 18th floor of a massive tower block in a busy part of Hanoi it is quite peaceful except for the constant blaring of horns far below while out on the street your senses are bombarded and you need to be very aware of everything going on around you. So on Sunday I got off to a late start, and first walked to a small lake we can see from our balcony. There is a temple there tucked in among the tall buildings. Most of the narrow fronted shops nearby specialise in car and motorscooter parts and repairs, with welding and grinding of parts on the footpath while also on the roadside, next door, there will be someone with a teapot boiling on a charcoal burner or someone with new clothing placed out for sale on a tarpaulin. An adjacent shop may specialise in Pho (noodle soup with beef available all day but popular for breakfast) which is cooked in front of the shop and and customers will eat inside or on low plastic stools on roadside. The rest of my day was spent at the Museum of Ethnology which is dedicated to the 68 identified ethnic groups in Vietnam. Most interesting was the outside area where traditional housing styles, from around the country, had been rebuilt. 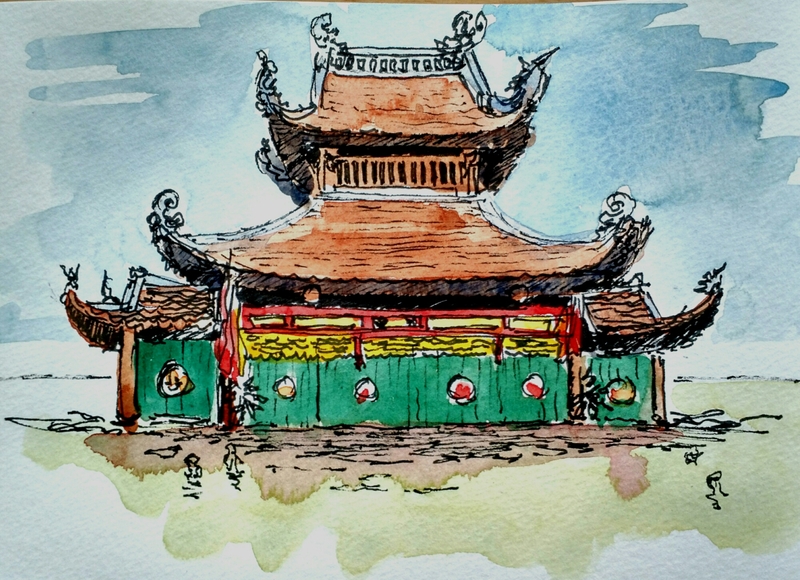 There was an outdoor Water Puppet Theatre (sketch above) and I was lucky to see a show which they only run on Sundays. For Monday I had managed to organise a tour to Hoa Lu and Tam Coc. This was probably the highlight of my trip so far, although the drive was two hours each way in a cramped van. 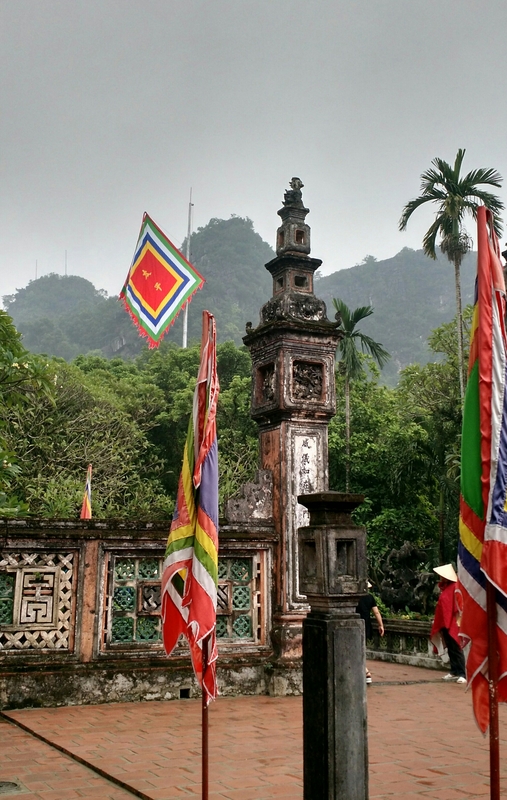 Hoa Lu was briefly the capital of Vietnam in the 10th century and is set amongst remarkable steep limestone hills. There are two beautiful temples, side by side, dedicated to the kings who reigned there. 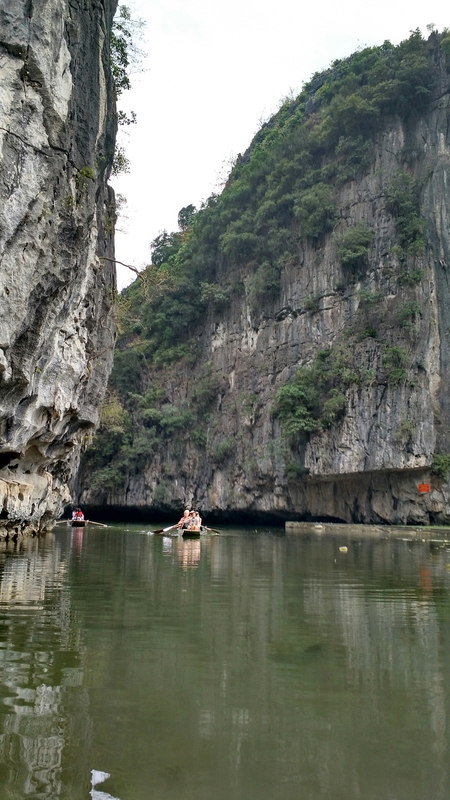 Lunch at Tam Coc was followed by a sampan ride through the most remarkable limestone outcrops travelling under three caves. The boats were propelled by locals who, mostly, rowed with their feet. All in all a remarkable experience. And in spite of the place being a major tourist destination with maybe 1000 boats it was very peaceful. A short cycle ride followed, through paddy fields and small villages and gave us a look at the lives of the country people.